Below is another illustration for the upcoming book 'Algonquin History: Through Our Eyes' by Anita Keith with contributing student authors. 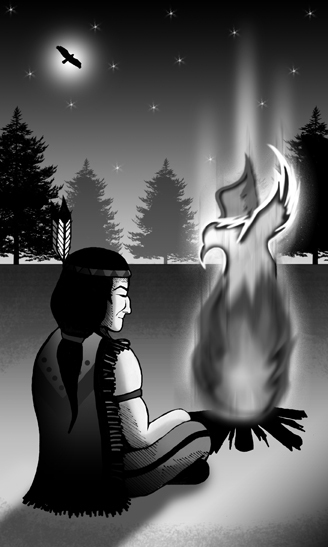 Depicting a vision quest, the eagle rising from the flames symbolizes ancient aboriginal beliefs, while the moonlit silhouette represents their basis in reality. In addition to this piece, the Design and Illustration pages of my portfolio have been updated with recently completed work. Be sure to check it out! Require creative or marketing assistance for an upcoming project? Drop me a line at "dclague @ oblada.com" (no spaces).